For generations, people have trusted Campbell’s to provide food and drinks that are good, honest, and authentic - and now they are trusting them with their families. In April 2018, the Campbell’s Family Center re-opened its doors as a brand new day care center. The Camden headquarters now allows employees to merge their work lives and family lives together, where infants and kindergarteners are able to receive an advanced education while their parents are hard at work. Push10 worked closely with Campbell’s to develop aquatic characters and scenery into an illustrative mural to compliment the fresh interior environment. Keeping the range of age in mind, characters were developed with friendly faces, bold lines and bright colors to fill the daycare with positive imagery. 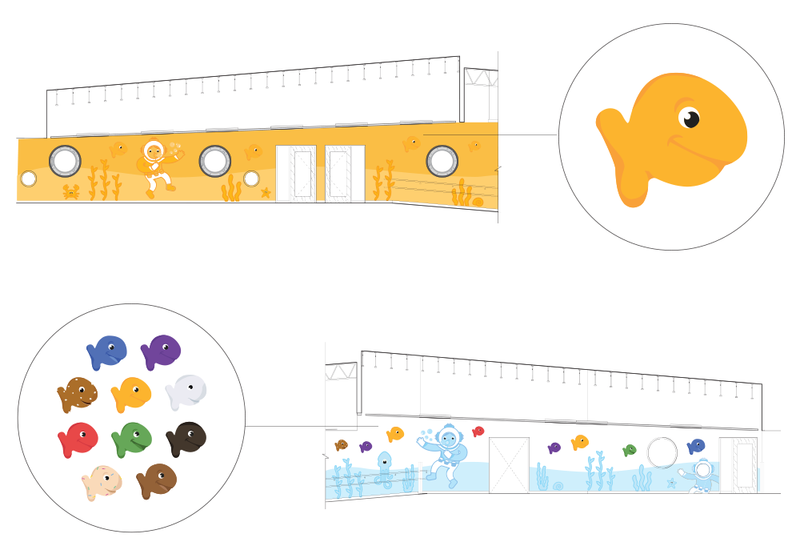 An underwater theme was inspired by the famous Goldfish snack, a product of Campbell's, and incorporated throughout the entire hallway. Push10 collaborated with a local fabrication shop to produce dimensional acrylic Goldfish and life size vinyl prints of each illustration. Framing the circular windows, wooden 'portholes' were also crafted to further portray the nautical theme.